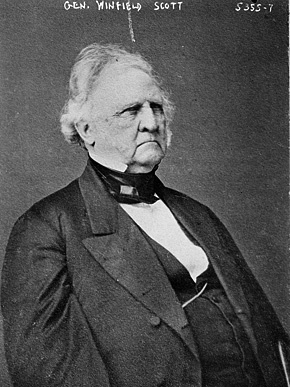 Winfield Scott (1786-1866), called "Old Fuss and Feathers," was the general-in-chief of the Union Army at the onset of the Civil War. He was a hero of the War of 1812 and Blackhawk War and commander of U.S. forces in the war with Mexico. He was a Whig candidate in the 1852 presidential election who caused many southerners to leave the party because he opposed the expansion of slavery into the territories. It is theorized that the phrase "Great Scott!" may have referred to General Scott.